I am not afraid of the scary clowns but I know some people are. As you all know the clowns are popular characters in horror movies. So in this Photoshop tutorial, I decided to create my own scary clown. I have found the most perfect figure on the internet to do this photo manipulation. You will see that it is rather simple to create and the result looks really nice! I hope you find this horror Photoshop tutorial interesting enough to share it with your friends. 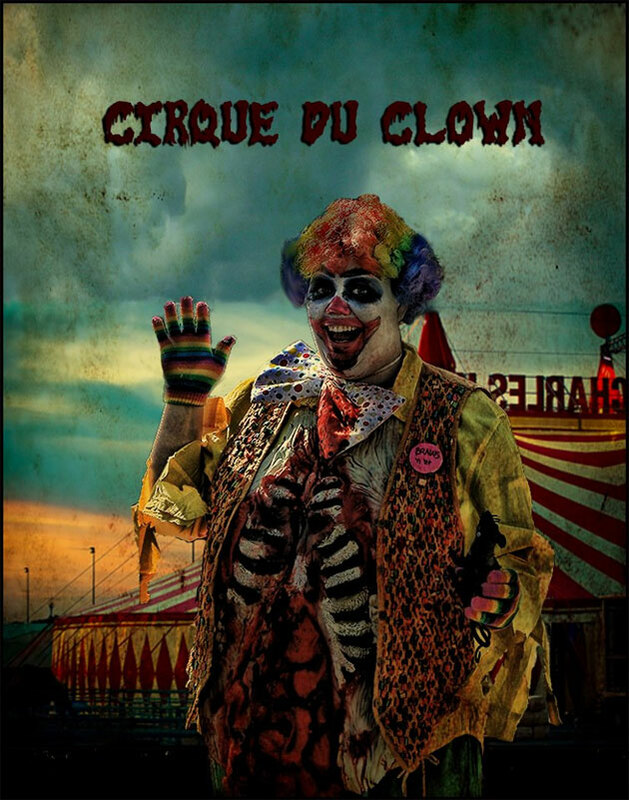 So let's start creating our scary clown and discover once more the incredible power of Photoshop! Use the Resize and Warp options to look like it is from the initial photo. Use the Eraser Tool to give a round shape in the neck area. Now we have to make this image look good! For that I will have to add first a background. I have found this sky and this circus . Very beautiful photos that work perfect with my clown. First add the circus image . Resize it to 50%. Duplicate this image and flip one of them horizontally. Change the blending mode of these layers to Hard Light 100%. Merge the two layers and erase the part from the left that is in the face area. Now lets add the clouds. Scale it to 115% to cover the image. Change the blending mode of Sky Layer to Hard Light 100%. As you can see we have three different images that don't match very good one with another. So in just two simple steps the image will be completely transformed! Ups big problem!I can't remember the link to the original image of one of the textures that I used in this image . If someone finds this image please leave me a comment with the link :). So I have placed this image above all the layers except the nose layer including the nose shadow. Change the blending mode of this Rusty Texture layer to Color Burn 95%. Now simply create another layer above all the other layers and with the Brush Tool draw with dark color the areas that you want to hide. Be careful to use a Soft Round Brush to give the impression that the clown is covered of dark shadow . You can of course after completing this step to return to every layer and play with contrast, use Burn/Dodge Tool to add contrast , play with colors , saturation levels etc. 23 comment(s) for "The Mad Horror Clown"
Well that really helped me a lot with my work. Thanks a million! thanks for reading my tuts, glad u find them interesting!